A new window will open, titled “Combine Files”. Click “Add Files…”, located in the top left corner of the window. 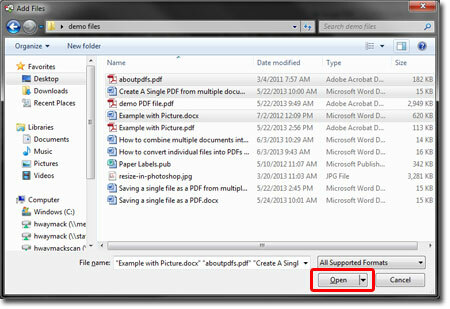 Select “Add Files” to add specific files, or select “Add Folder” to add all the files in a specific folder. A new window will open, titled “Add Files”. Select the files you would like to use. You can select several files at once by holding down the Ctrl key while clicking. Click “Open” when you have selected all the files you want. To add more files, click “Add Files…” and follow the instructions in the previous step. 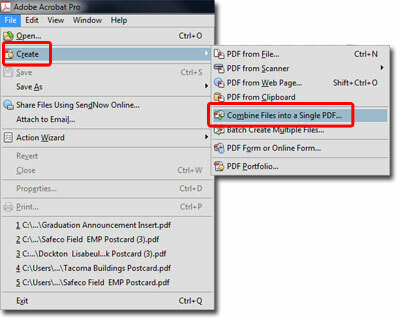 When all the files are in the desired order, click “Combine Files”, located on the lower right corner of the Combine Files window. 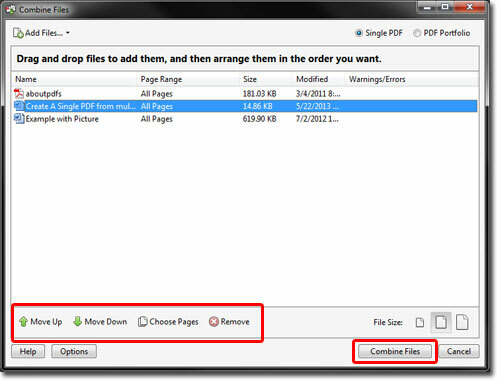 A status bar will appear at the top of the window, indicating the progress of the PDF creation. When the PDF is done, it will automatically open. Name and Save the new PDF. By default the new PDF will be titled “Binder1.pdf”. You can keep this name, or name it something that more accurately describes the content of the PDF.